And we wake up to another ridiculous move. Someone finally realized that the forecasted rain wasn’t going to increase the flows enough to meet the downstream targets so the release from Cannonsville has been raised to 589 cfs. 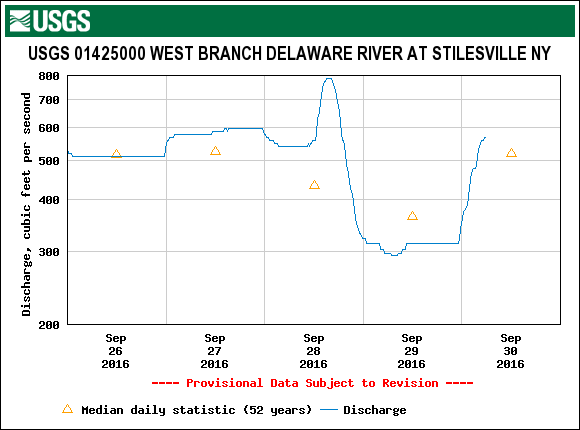 The Mainstem flow at Lordville hit an unbelievable low of 553 cfs. For years we have watched them prematurely drop the releases counting on rain to meet the Montague target and for years we have watched the yo yo release increase when that rain misses us. Nothing has changed. The West Branch is now back in good shape for wading and floating. The Mainstem will come up a bit with the increased release but should settle in by evening. Olives, isonychias and caddis have been out in good numbers when the river isn’t screwed up from Yo Yo releases. We are beginning to see a few Heptagenia hebes on the water plus the flying ants are around. During the off hatch times we have been doing well with small dark woolly buggers and smaller pheasant tails and hare’s ears. We may see a 1/4″ of rain today with most of it falling in the morning. We have been dry so we expect most of the precipitation to soak into the ground. They are still calling for decent cloud cover and light rain through Tuesday. If they stop screwing with the release it should fish well over the next few days.